Painting Acrylic on Canvas | 58" x 37"
Painting on Canvas | 58" x 37"
Painting Acrylic on Canvas | 24" x 60"
Painting Acrylic on Canvas | 44" x 33"
Painting Acrylic on Canvas | 37" x 37"
Kishore was born in a place where he had a opportunity to watch the STEAM LOCOMOTIVES. Throughout the day the steam locomotives were running in front of him with the whistling and steaming. For him it's a big nostalgia. The ambiance was like that the locomotives had a giant appearance of the black body with the white steam around him. It was a dramatic visual experience which was making crazy to Kishore. Which was encouraging to kishore bring down the memory on canvas. Kishore used to go to the locomotive workshop day after day to study that from a close view. He seriously had fallen in love to the steam locomotives. He did watercolor and oil sketch mostly in sepia tone. In the locomotive workshop the firemen and drivers were to be good friend of Kishore. They always came to him to take a look their picture on the sketch book. Few of them were also sitting with him for making their own portrait. Kishore remembered that, all time their looked very black and dark because of the dust of coal. Their faces always had a interesting sprite of life, which always inspired him to draw their portrait. They never had any complain about their hard life. He loved to sketch them, study their faces with pen and ink, charcoal, soft pastel and pencil. They wore always in a particular dress of dark blue with a cap. Kishore tried to catch their emotions in the character. Watching their lifestyles, listening their stories... still today Kishore is working on their life with the locomotives... That is how the "Nostalgia of steam locomotives" came. “For years, I woke up at midnight and started painting impromptu. I still find that very gratifying.” - Meet Kishore Pratim Biswas, India’s upcoming expressionist independent artist. Kishore’s 15-year journey in modern contemporary art movement has not only strengthened his unconventional thought process, but architected his painting style too. Born in Kolkata, 42 year-old Kishore was passionate about art since childhood. After graduating in Fine Arts from Government College of Art & Craft, Kolkata, 1996. Kishore spent some struggling years in his hometown and then moved to Mumbai in 2009. Today Kishore has his own studio in Mumbai. Kishore started by primarily painting in water colors. But his talent knew no bounds. Gradually, he switched to painting Acrylic on canvas. Today, he stands on a solid intellectual platform and his work reflects a unique streak, where color is of great importance, and form happens to be only incidental. He uses the texture in the canvas as well as experimental methods to add the finishing touch to his meticulous paintings. Kishore is also an expert in acrylic, oil, watercolor, mix media, charcoal, and soft pastels. 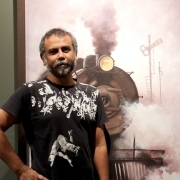 Kishore organized his solo exhibition in Kolkata in 1996. In 1997, he displayed his work of art at several group shows around the country. Even though Kishore has a long way to go, his paintings are slowly making their way into the homes of collectors of modern Indian art.